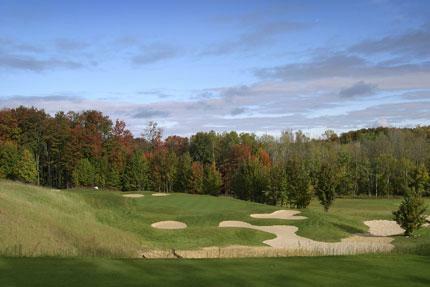 There is no shortage of places in Michigan to hold your golf event. However, we can assure you that you will be extremely satisfied with a golf outing or tournament at A-Ga-Ming Golf Resort. With a variety of courses and dining options, we will be able to work together to create the perfect combination. Have professionals host your next outing to ensure a successful event! Whether it's a 150 player charity event or 16 guys from the office, A-Ga-Ming Golf Resort is the ideal choice. Many corporations, associations, clubs, and private groups have chosen A-Ga-Ming to host their events. The Sundance offers expansive windswept fairways, spectacular views, free-flowing heather covered mounds, and greens so good you won't want to leave. The Torch and Antrim Dells courses boast some of the best lake views around, encompassing what Pure Michigan golf is all about. Charlevoix Country Club offers a pristine course with beautifully manicured bent grass fairways and a landscape conducive to an upscale golfing environment. Out of these four courses, you are sure to find what you are looking for to hold your event! Perhaps the most common compliment we hear repeatedly at A-Ga-Ming is the excellent condition in which we maintain our course. We strive to maintain tournament level conditioning every day, all year long! Our Superintendent, Jim Tollefson, and the maintenance staff work hard each day to make sure every golfer has the best experience possible. 3. Duffer's is Delicious and the Golf Course Service is Prompt! There will be no shortage of cold drinks and delicious food at your event - guaranteed! When you visit A-Ga-Ming, we'll put the perfect menu together for any number of golfers. From delicious boxed lunches on the course to outdoor cookouts, we've got you covered! Our shop has a great selection of men's and women's apparel, equipment, accessories, and of course, tournament gifts. Special pricing is available for group volume purchasing. Our clubhouse boasts both indoor and outdoor seating for the smaller intimate groups. The outdoor pavilion can accommodate up to 275 people. Both facilities captivate you with spectacular panoramic views of Torch Lake. 7. Our Professional Event Management Staff Takes Care of All the Details So You Can Just Sit Back and Enjoy Your Event! Our staff members are experienced in the art of hospitality and are here to help you with every aspect of your event. We are committed to providing you with friendly assistance from the planning to the production of your event and will be glad to customize a tournament or outing to your exact needs. That said, we think you'll find our tournament package included with all events is a pretty good start! • Assistance available in organizing putting contests, door prizes, hole-in-one events, gift certificates, hole sponsor signs and prizes..